So, I believe in writing up Stitch Fix reviews, because the mystery element in this styling service is both appealing and nerve-wracking. Unfortunately, Fix #1 was a bust, but I diligently gave tons of feedback, tweaked my style profile and I was pretty excited when Fix#2 arrived! 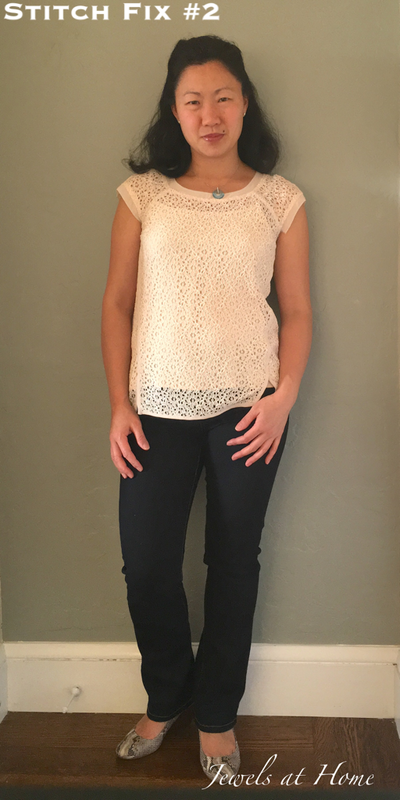 I’ll show you all the goodies, but here’s a picture of the two items I kept: a pretty lace blouse from Pixley and these super-comfy Liverpool jeans. 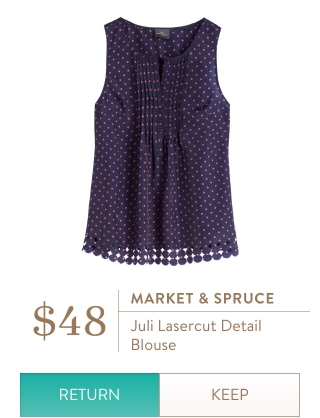 Market & Spruce Juli Lasercut Detail Blouse. I really like the elements of this blouseL the navy and pink, the polka dots, pleats, and details on the hem. However, when put all together, this top was just a bit too cutesy for me. The fabric is a bit shiny-cheap, too. 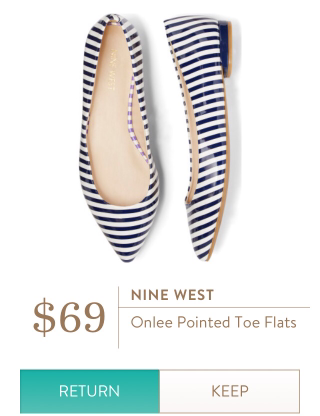 Nine West Onlee Pointed Toe Flats – I was actually excited to see the striped ballet flats, since flats are the staple of my shoe wardrobe, and I have been eyeing cute striped shoes. However, the finish on these is super-shiny and plasticky feeling, and I just didn’t like them enough to keep. Donna Morgan Sunni Dress. Not really sure what happened here. I do like the color navy and the geometric print, but I noted in my style profile that I do not like high necklines or dresses with fitted bottoms, so this was really a miss for me overall. Too bad! 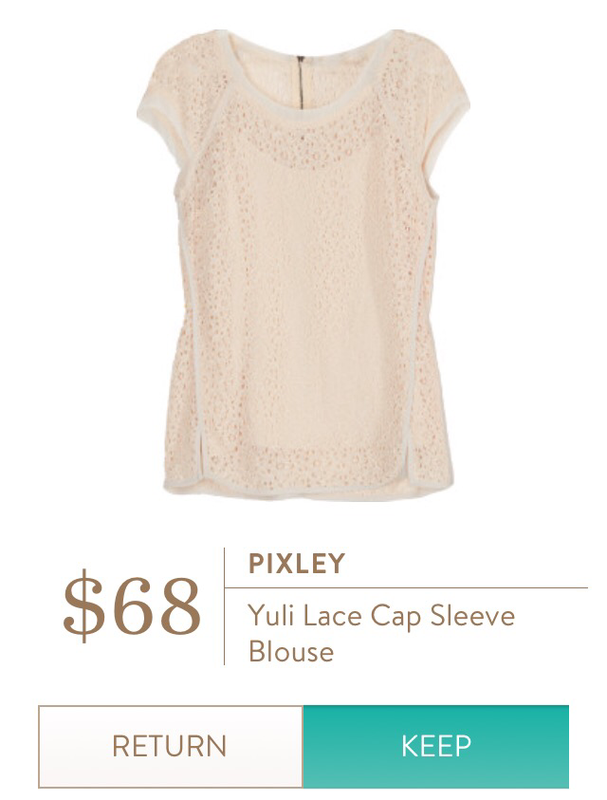 Pixley Yuli Lace Cap Sleeve Blouse. I fell in love with this blouse as soon as I saw it! The color is actually a light light peachy-pink, but it is neutral enough to go with everything. The lace is pretty and feminine, and there are beautiful details in the collar trim and the seaming. The top hangs very nicely for a flattering but not clingy fit. Yay! Being introduced to something new and beautiful like this is exactly why I joined Stitch Fix! 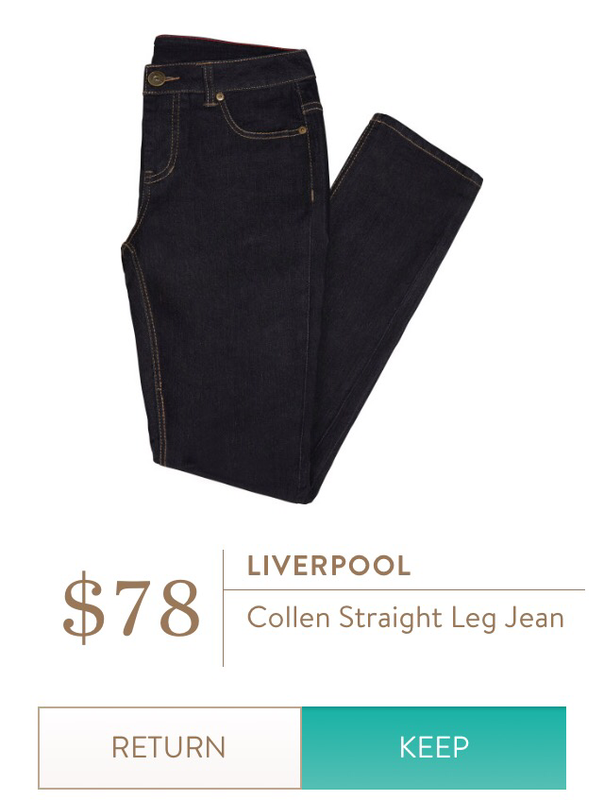 Liverpool Collen Straight Leg Jean. When I first saw these jeans, I thought they were a bit blah. I had actually asked for special items and no basics, so I was disappointed. However, I did try them on, because I wanted to be able to give feedback on the fit. And these jeans are SO comfortable. I kept thinking I should return them, because I don’t really need jeans, and these have a pretty basic look – but I seriously could not bring myself to take them off! The material is 81% cotton, 17% polyester, and 2% elastic, and they feel like wearing stretchy comfy yoga pants. Happy I kept them! If you are counting, you’ll see I kept two items and returned three. Not a home run, but I am pretty excited and definitely ready to try Stitch Fix again! I’ve scheduled my next fix for a couple of months right now and look forward to reporting back! If you are thinking of trying Stitch Fix, you can use my referral code. Thanks! Looks great! I wish they delivered to Canada. I like the idea of this service a lot.